That’s the sad fact when it comes to government data on inflation. The phrase “lies, damned lies, and statistics” may have been popularized by Mark Twain, but the concept is still every bit as vibrant when it comes to current economic measurements. This year, the Social Security Administration graciously gave seniors a 0.3% Cost of Living Adjustment (or “COLA”). In other words, Retirees who collect monthly Social Security payments, were treated to a miniscule raise to cover higher living expenses. As you’ve probably heard, the low adjustment is based primarily on the government’s measures of inflation… Which are a joke! You see, the labor department’s “Consumer-Price Index” is designed to measure costs for consumers, and tell us if inflation is rising. A rising CPI indicates that it takes more dollars to pay for goods and services. And if the CPI is steady, it means that prices are not rising and inflation is not a problem. Of course, like most statistics, the CPI can be manipulated to tell you whatever you want to hear. And in this case, the government wants you to hear that inflation is tame. That way, they don’t have to increase Social Security payments. That way, the Fed can justify juicing the economy with lower interest rates. 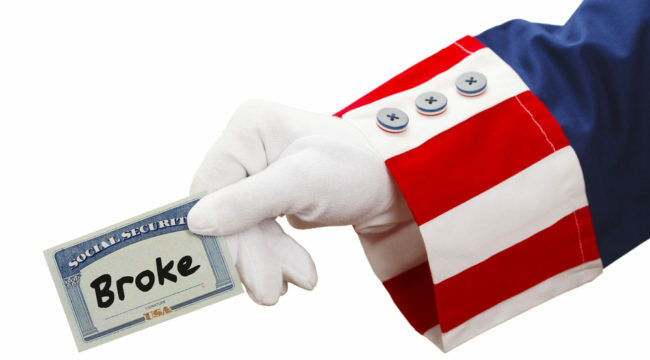 In short, the Cost of Living Adjustment calculation makes a mockery out of the U.S. program that is supposed to provide retirement income for U.S. workers. According to the Labor Department, “core inflation” rose just 1.9% in April. And that followed a 0.3% decline in consumer prices in March. These are the statistics that allow government agencies to claim low inflation. The “core inflation” reading strips out important costs such as food and energy. 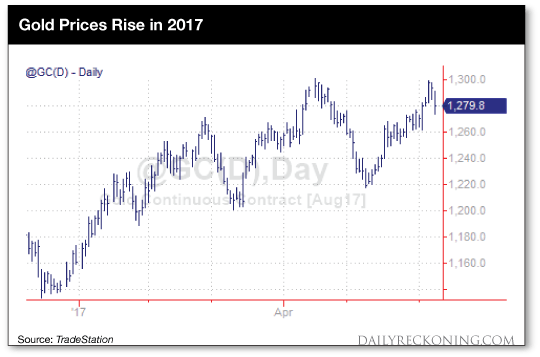 So if gasoline prices rise, or if it costs you twice as much to buy groceries as it did a few years ago, that doesn’t matter. These costs are considered too “volatile” and so they’re excluded from the calculations. 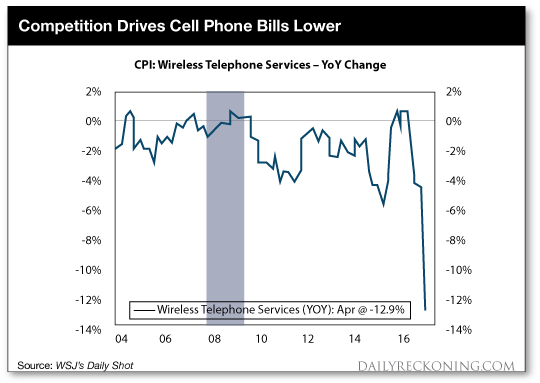 Another reason official inflation readings have been artificially low is because of a price war between cell phone carriers. Since Sprint, AT&T, and T-Mobile have been lowering prices to attract customers, inflation levels have dropped. Below, you can see that the cost of wireless telephone service has dropped roughly 13% over the last year. Now, tell me… Does your cell phone bill make up so much of your budget that it has a major effect on how much you can spend? Hopefully not! Also, do you think a 13% drop in cell phone prices is a trend that will continue? Or will prices stabilize? And if they stabilize, is this really a legitimate indication that inflation is low? Sure, cell phone bills may be higher for big families like mine, with multiple teenagers using up data by streaming YouTube videos and online music. And so I’m personally thankful for lower data prices on my cell phone bill. But do those lower prices really help Social Security recipients — most of whom are not buying unlimited data packages with multiple cell phone lines? On the other hand, inflation for legitimate expenses like medical costs and rent rates are moving sharply higher. 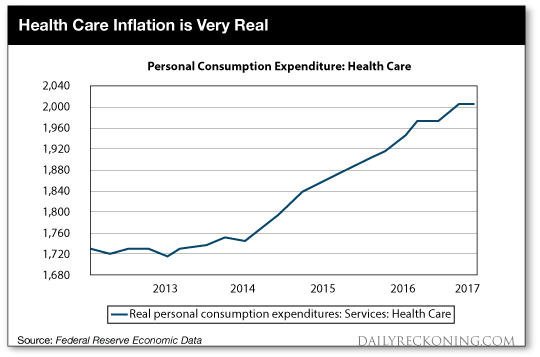 Below is a chart that shows the increase in personal spending on health care. And keep in mind, this is based on the government’s damned lie… ‘er, I mean statistics, which you can bet will show the least amount of inflation possible. You may think that higher rental expenses won’t matter much to seniors. After all, you would expect many retirees to own their homes outright with little or no mortgage expense. While I don’t expect the government to change their methods for measuring inflation anytime soon, that doesn’t mean you can’t fight back. Today, I want to encourage you to take matters into your own hands, and protect your wealth against inflation. And one of the very best ways to protect your wealth against inflation is with exposure to precious metals. I recommend buying physical gold and silver today. Both gold and silver should increase in value as inflation picks up in the U.S.
Keep in mind, the price of silver is likely to outperform gold over the next few years. That’s because silver prices are trading at a historically low ratio to gold prices, and that ratio tends to swing back to a “normal” level during bull markets for precious metals. At the same time, demand for silver should increase not only from investors wanting to protect their wealth, but also from true users of silver in the technology, medical and even alternative energy industries. The thing to remember is that no matter how the government fudges the numbers, it can’t fool the market. Gold and silver prices have been moving higher this year because it is clear to investors that inflation IS happening (despite the low “fudged” CPI readings). If you buy gold and silver with a portion of your retirement funds (I recommend at least 5%), the value of your precious metal positions will increase. And that will help protect your wealth from higher inflation – regardless of how that inflation is measured.